FREE Wedding Budget Calculator - Click here! Liz and Friday’s Nigerian wedding, which took place on a grassy outdoor venue, was incredibly elegant and colourful. 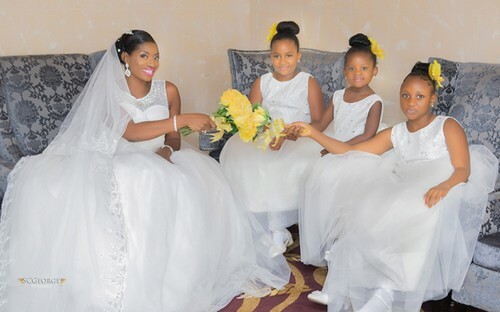 This yellow-themed Nigerian wedding is one that is full of elegant inspiration and copy-worthy ideas for stylish brides-to-be. There’s a touch of yellow in almost every wedding element, it’s not ‘shouting’ but rather elegantly combined with the colours of the grassy surroundings and outfits of the couple and their wedding party – and the result is a very pleasant ambiance and gorgeous picture-perfect backdrops. This couple’s outdoor wedding venue decoration is simply breathtaking. Would you be surprised if I told you that the bride is an interior designer, and she hired the very best wedding vendors to bring her wedding vision to life. 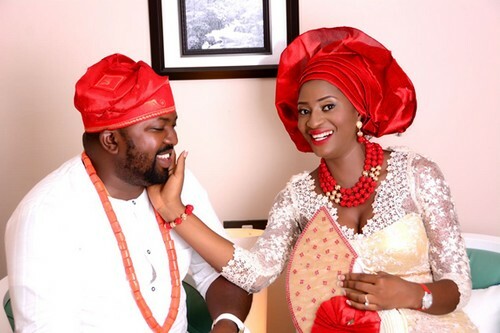 So, let me introduce you to today’s real-life couple – Lizondo Onoja (bride) and Friday Haruna (groom). Read on for their ‘how we met’ story and see their gorgeous wedding photos below. 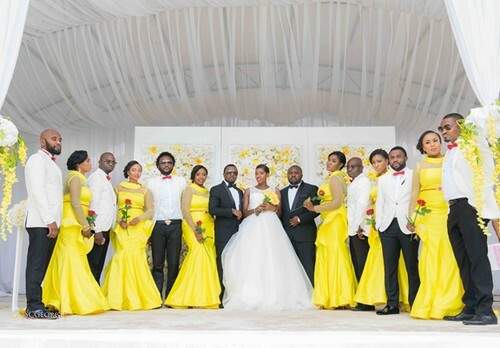 As you’ll soon see, this wedding will make you fall in love with the colour YELLOW. 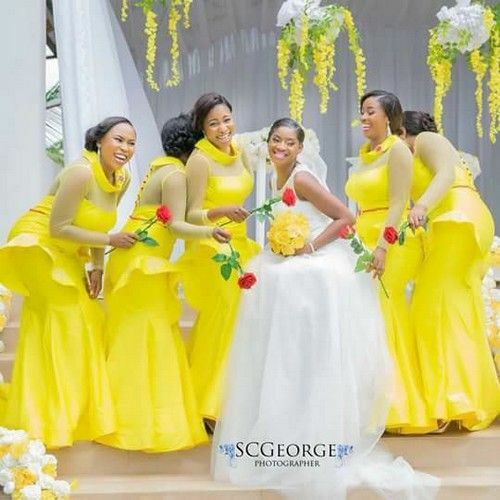 If you always hated yellow, the pictures below will make you change your mind – maybe, you just didn’t know how to combine it like Lizondo and Friday did in their wedding styling and design. *The bride, Liz, sent me her wedding story and pictures in mid-October. If you’d like to see your wedding on this blog, click here to contact us – it’s free. As the bride, Liz, puts it, theirs is a story of “business acquaintances turned lovers, and now married”. That ‘one can find love in the most unusual places’ is so true for this couple – it was love at first sight for him, at a business. So, Liz’s first meeting with Friday (now her husband) was to discuss business, but then when the bobo first sighted her, he fell in love – and, according to Liz, his discussion took a new turn. But for Liz, it wasn’t love at first sight. She says: He went back to his base and we started talking. Gradually, I started falling for him. On how their love affair turned into marriage proposal, Liz says: We lost contact for a year. Then he got back in touch, and asked me to marry him. Although they had the most amazing wedding venue, the high point of their wedding day was the blessings of being surrounded and supported by the people that cared for them, as they embarked on the journey of marriage. The happy faces of Liz’s bridesmaids and groomsmen is golden. Liz and Friday’s venue had an amazing outdoor landscape – and the décor vendor’s skills brought out the beauty of the natural, grassy surroundings. Venue decoration was simple, yet classy, because the surroundings were naturally beautiful. The walkways, the couple’s seating area and the guests area and were accented and adorned with a dash of yellow flowers. Did you see the gorgeous flower backdrop that almost reminds me of Kim Kardarshian and Kanye’s wedding photo backdrop? A touch of yellow in their hair: Aww! Look at how cute the yellow-white colour combo is. For their traditional wedding, Liz and Friday, went for a different colour scheme, this time red and white – and as you can see, they rocked it pretty well. 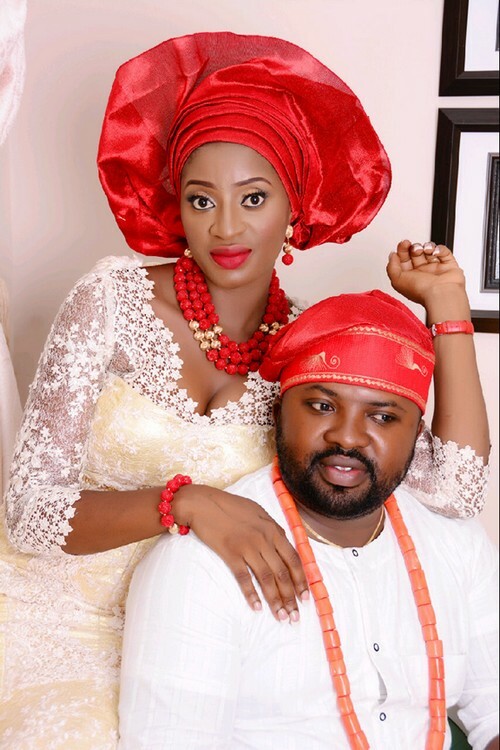 We, here at NaijaGlamWedding, wish Lizondo and Friday a happy married life and every day of marital bliss. We are wedding freaks, and so are our readers – we’re never tired of looking at glam wedding pictures, and reading love stories from newlyweds excite us. 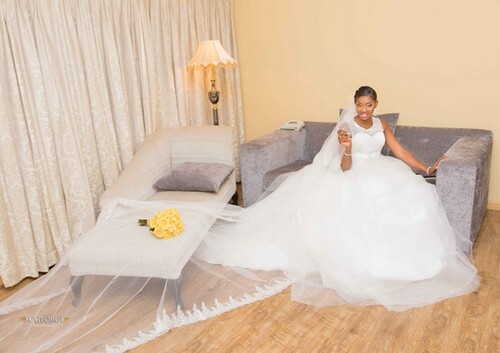 So, if you’d like to see your wedding pictures published on this blog, it’s easy – just click here to tell us about it, OR email your wedding photos to us at NaijaGlamWedding (at) gmail.com. NOTE: We only publish weddings that have BOTH pictures and stories, so be prepared to tell your story. So, this is where we wrap it up on Liz and Friday’s glam, yellow-themed wedding. If you’re in the middle of planning a wedding (for yourself or for someone), we hope this featured wedding sparked off some ideas in your head. And, if you like this featured wedding, please tell your friends to come see it too – instagram to them, facebook them, tweet to them, email to them. Finally, leave us a comment down below to tell us what you think about this wedding, or you may even leave a congratulatory wish for the couple. 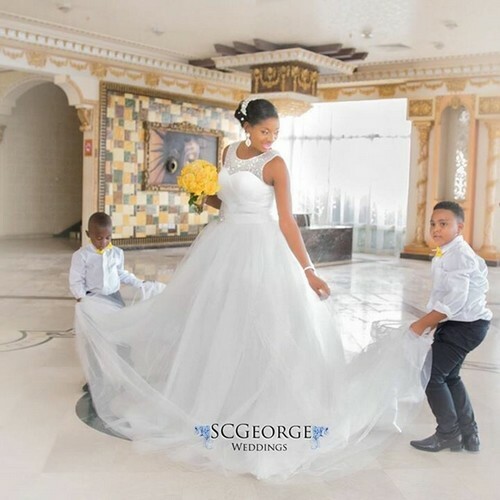 Stella is the founder and Editor of this blog (NaijaGlamWedding). Follow us on Facebook, Instagram, Twitter, Google+ and Pinterest. Submit your photos to be featured - it's FREE, because we love everything weddings, bridal showers, engagement shoots. 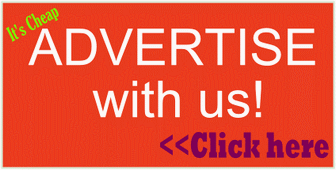 All articles on this site are copyrighted. Please do not reproduce or distribute our articles in whole or part, in any form. Unauthorized use and/or duplication of this website’s articles/ contents without express and written permission from us is strictly prohibited. 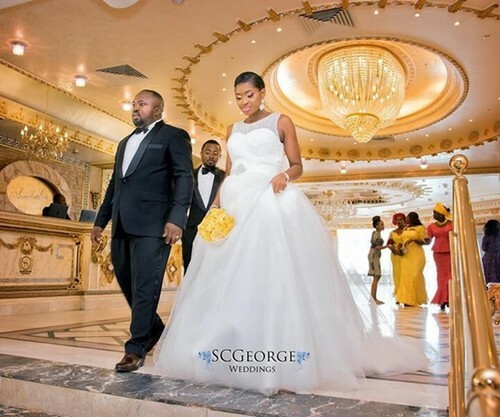 Excerpts and links may be used, provided that full and clear credit is given to NaijaGlamWedding.com, with appropriate and specific direction to the original content here. ©NaijaGlamWedding.com.